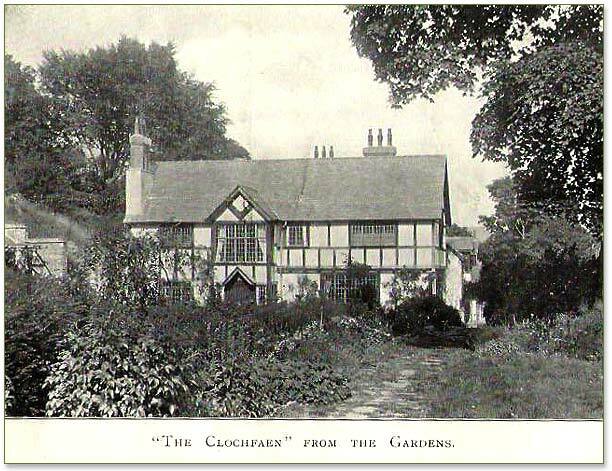 The Clochfaen, the late Victorian house, circa 1904. What was there architecturally at Clochfaen in 1913 for Benson to work upon? J R Stirk and R W D Fenn (Montgomeryshire Collections, 1987) re-examined some old questions around the origins of Clochfaen. What does Clochfaen mean? “Cloch” means “bell” and “faen” means stone. Fenn believes that the house took its name from the ridge, “Esgair Clochfaen”, and not vice versa, on the ground that the names of geographical features generally preceded place names and house names. The more romantic Victorians had other theories. Edward Hamer and Howel William Lloyd, the Llangurig Parish historians of the 1870’s, postulated that the word “Clochfaen” was descriptive of a bell-shaped rotary quern, “Y Clochfaen”, which remains at the Clochfaen house to this day. Such querns or hand mills were in use in Britain from pre-Roman times until a couple of hundred years ago, and the Victorian suggestion is perhaps as improbable as suggesting that Kenwood is named after the famous mixer! Undoubtedly the quern can have nothing to do with the name of the neighbouring farm, Clochfaen Isaf. 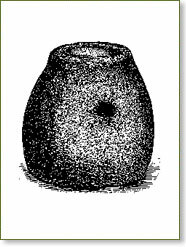 Further, the rotary quern, while a fascinating relic, is not unique, and it is hard to see why a domestic implement which was once in common use would give its physical description to a place. A quern looks like a stone bell, but obviously is not one. 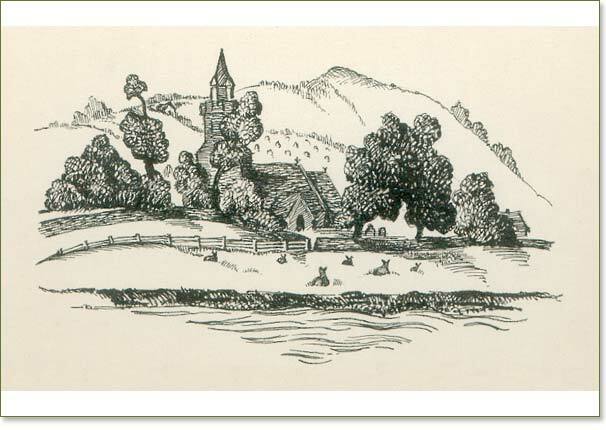 A further suggestion from Hamer and Lloyd and Colonel George Hope Lloyd Verney (Description of Llangurig Church, 1892) is “bubbling stone” or, alternatively, a place of bubbling springs; and “stone of worship” is put as a possibility by the great eclectic and eccentric historian of upper Powys, the colourful Chevalier Jacob Youde William Lloyd, historian, philanthropist and religious controversialist, owner of the Clochfaen Estate from 1864 until his death in 1887. 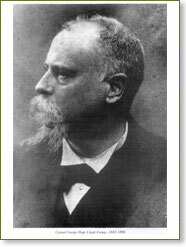 His wide ranging History of Powys Fadog was published in six volumes from 1881. The late G.G. Evans, noted expert on Welsh place names, pointed out that “carreg ateb” is the name of a rock face believed to cause an echo, an answering stone. In this context he believed that Clochfaen referred to some kind of resonance, connected with some aspect or other of the local topography. In this he may have been inspired as the valley between Clochfaen and Voel Curig is highly resonant, and on a quiet evening with a favourable breeze you may hear the river Wye running over its rocks and stones. The real significance of the quern, “Y Clochfaen”, is the age of the habitation which it indicates. “Y Clochfaen” was recorded in Hamer and Lloyd’s Llangurig Parish History (1875) and has been taken to be pre-historic. The Royal Commission Inventory of Ancient Monuments in Montgomeryshire (1910) recorded several quern stones shown to the inspectors by Harriet Julia Morforwyn Lloyd Verney, the Chevalier Lloyd’s niece and Harry Lloyd Verney’s mother. 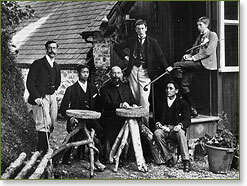 Some of these had been used at Clochfaen as garden tables and photographs of the 1890’s show the Princes Cheroon and Amorolat of Siam seated beside them behind the old Victorian house. Several other pre-historic artefacts are recorded as having been found at Clochfaen in the nineteenth century. At the far western end of the Estate, on the same ancient track network which passes through the Clochfaen grounds, lies the Cistfaen, a cromlech or reputed burial mound. The late E T Stirk was correct to see the significance in the locally famous holly tree which stood on the bank of the hillside behind the Clochfaen Uchaf farm house of 1810. Hollies also have a sacred significance in folk lore. 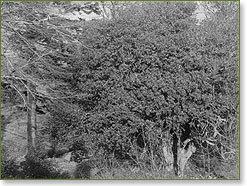 The Great Holly Tree, circa 1947. The author of this verse uses the term Clochfaen Court, which inspired the Chevalier Lloyd to depict, in 1879, a fairytale castle in the stained glass windows of the local Parish Church. The Chevalier transcribed many poems concerning Clochfaen and the district from manuscripts in the British Museum, collaborating with his friend, the antiquarian Howel W. Lloyd. As the Chevalier paid £11,000 of his own money in the restoration of the Parish Church, the indulgence of the fairytale castle may be excused, but it has no basis in historical evidence. The ancient bard, we expect, was rewarded for the description with a good meal! Stained glass windows in the Parish Church (restored 1877-1879, architect Sir Gilbert Scott; glass by Burlison and Grylls, Newman Street, London; patron and designer, Chevalier J Y W Lloyd) depict heraldry of the Lloyds of Clochfaen from medieval times. 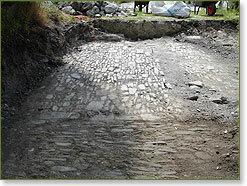 The earliest recorded remains of a building on the site are those of pebbled (or “pitched”) floors which were, according to Colonel Lloyd Verney, visible in 1892, and which were recorded by his son, Harry Lloyd Verney, as further exposed in 1913 by the preliminary levelling of the ground for W A S Benson’s new Clochfaen. This has been assumed to be part of the floors of the house at Clochfaen which, according to tradition recorded by Chevalier Lloyd in the History of Powys Fadog, was destroyed by fire in 1760 when Clochfaen was in the ownership of the last male of the medieval Lloyd line, Jenkyn Lloyd. Again, it was family tradition, recorded by Chevalier Lloyd, that Jenkyn was murdered (said to be by poison) by his doctor at the instigation of Jenkyn’s cousin, Sir William Fowler of Abbey Cwm Hir and Harnage Grange, the motive being litigation against Sir William concerning Jenkyn Lloyd’s claim to the Abbey Cwm Hir estates. Could the burning of the house have been an early example of domestic arson in Wales? All is speculation as solid evidence of the fire and the murder is so far elusive. If any reader knows more, please tell us! The building of 1760 is said by Chevalier Lloyd (1882) to have been half timbered, similar to many in Montgomeryshire. Cilgwrgan Fawr in the valley opposite Clochfaen has internal half timbering, although Llangurig is rather high for oaks to grow well. From this notion of a “black and white” house (a Victorian interpretation of half timbered structure) Mr. Benson was asked to take his design, and he produced something which bears no resemblance to any timber framed house from the Montgomeryshire tradition, much more to the Edwardian Arts and Crafts idiom. Every habitation needs water. In the Benson designed garden is a well, set into the hillside, in which water naturally collects. According to Colonel Lloyd Verney (1892) this well was in or adjacent to the kitchen of the house which was destroyed in 1760. So much for old history: now for eye witness accounts from the last hundred years, illustrated with contemporary photography, a historical galley of Clochfaen. 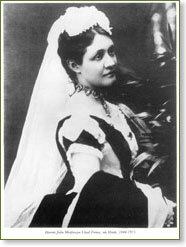 On the death of Chevalier Lloyd in 1887, the Clochfaen Estate passed to his niece, Harriet Julia Morforwyn Verney, nee Hinde. Her husband was George Hope Verney, third son of Sir Harry Verney, Bart., of Claydon, Buckinghamshire, and a colonel in the Hampshire Regiment. He and his wife took the surname Lloyd Verney as a condition of the Chevalier’s will. Colonel George Drew of the 1st. London Volunteer Royal Engineers became the agent of the Estate, and Private Thomas Lovell of the Hampshire Regiment became the resident Keeper. Clochfaen was then re-created as a mixed collection of buildings while the new family continued the tradition of the Chevalier Lloyd and poured money into the improvement and development of Llangurig village and the Clochfaen Estate farms. For the development of leisure activities, a nine hole golf course was created on Esgair Clochfaen and lakes were constructed on the Estate at Tyn-y-Maes and Tanllwyn. In the construction of the lakes and a wooden suspension bridge over the Wye in front of The Clochfaen may be seen the hand of Colonel Drew of the Royal Engineers. Old Clochfaen, or Clochfaen Uchaf, was a charming vernacular stone farm house said to have been built in 1810. A former farm cottage, seventy five yards or so to the north of the farm house, was attached to stables and a former barn further to the north. The upper part of the barn was converted in 1888 to a large living room called “the Tenants’ Hall”, with a stable below, and the old farm cottage was embellished with a south facing bay window to create independent accommodation with four bedrooms – the “Victorian House”. In between these two buildings was a garden area with a fives court cut into the hillside, and a circular thatched summer house built around a large tree stump. Colonel George Hope Lloyd Verney’s younger brother, Frederick, had entered Parliament as Liberal member for North Buckinghamshire, and became the Secretary to the Siamese Legation in London. 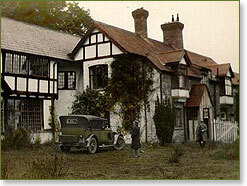 Frederick and his wife made a home for the Siamese Princes when they were sent to England to be educated at Harrow, and, in 1890, the Clochfaen hosted the Princes Cheroon and Amorolat and their tutor, Dr Mark. The Princes, sons of Rama V of Siam, were much the same age as Colonel G H Lloyd Verney’s children, James and Harry, also at Harrow. In 1891, a railway carriage was installed in a small garden to the west above the Victorian House, creating a second, unique summer house with magnificent views; and, in 1892, a “cottage” in the style of construction of a “tin tabernacle” was built beside the fives court. In 1893, the Victorian House was improved by the addition of a linear conservatory connecting the Tenants’ Hall at the north end to an upstairs living room at the south end. Ledges were added to the south facing bay window on which were placed statues of the Lord Buddah, commemorating, no doubt, the visit of the Princes in 1890. A statue of the Buddah now stands in a niche of the new Clochfaen, to commemorate the same extraordinary event – not, however, the last occasion on which Clochfaen would be the retreat of royalty. “On July 31st, 1913, on the death of my Mother, Mrs Lloyd Verney, I succeeded to The Clochfaen Estate, and in September of that year my Wife, Lady Joan Lloyd Verney, and I came to live at The Clochfaen. The house then consisted of four bedrooms, two sitting rooms, and the servants’ bedrooms (built on the site of the old stables and under the Tenants’ Hall), which were just completed but had not been lived in. The new stables with two cottages on the hill above the house which were built by my Mother were finished and the keeper (Lovell) and his family were living in one of these cottages. Old Clochfaen, built in 1810, was standing empty, and owing to its condition was about to be pulled down. 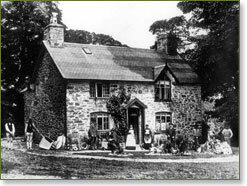 In October, 1913, Mr W. A. S. Benson, the architect, stayed with us in order to advise as to making the necessary additions to the house, and at the end of October Old Clochfaen was pulled down to clear the site, the stone, which came originally from the Estate quarry at the Skew Bridge and other materials, being kept to be used in the new buildings. Before any work could be started it was necessary to clear away some of the large trees which entirely shut out the views to the east, and which would have been a danger to any buildings near them. These trees, mainly sycamore, were very fine and of great age; and in all some ten or eleven about the site were cut down. During the winter of 1913-1914, Mr. Benson drew out plans for a two-storied half-timbered house, to connect with the house then standing. One of the reasons for choosing this style of architecture was that the original house of the Lloyds of Clochfaen, burnt down in 1760, was, according to the “History of Powys Fadog” and other books relating to Montgomeryshire, a “black and white” half-timbered house. The tender of Messrs. Thomas Morris & Sons, builders, of Shrewsbury, for carrying out the work was accepted, and in May, 1914, the builders began work. In March, 1915, we were able to live in the east bedroom, dressing room and dining room. By May, we occupied the whole of the bedroom floor, and in August we were able to use all the rooms in the new house. As in the case of the old building of 1810, the stone was drawn from the Estate quarry. The sand for the plaster, cement, and concrete came from the river Wye – about a quarter of a mile north east of The Clochfaen. Part of the oak used externally on the new house was in the Old Clochfaen. Panoramic view of the New Clochfaen, east frontage, from 1921 sale particulars. In the course of levelling the ground for the new house the workmen came upon the old pebbled floor of the original building (burnt down in 1760) which stood on the present site. SMALL OUTER HALL. – Panelled in walnut about one hundred years’ old. LIBRARY. – This room was carefully designed with the view to containing the Library from Carriden House, Linlithgowshire. This property, which was purchased by my great grandfather, Admiral Sir George Hope, in 1812, with the prize money gained by him during the French Wars, in which he served as one of Lord Nelson’s Captains, was sold by me in 1913. Many of the books belonged to my great great great grandfather, the first Earl of Hopetoun (1681- 1742), and contain his book-plate. This small collection was added to by his second son, the Hon. Charles Hope Vere, Sir George Hope and Sir James Hope. The carved cornice and the gilt mantelpiece, both of Charles II. period, were originally in Nell Gwynn’s house in Dean Street, Soho, London, and were given to my wife and me by my aunt, Mrs. Frederick Verney. STUDY. – The Charles II. 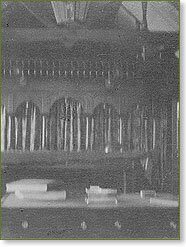 carving over the fireplace and the pair of cupboard doors in this room were the gifts of Mrs. Verney. The carved doors with ironwork leading to the garden entrance were once in Windsor Castle, and were also given to us by Mrs. Verney. DRAWING ROOM. – The Adam mantelpiece was taken out of one of the houses on the Hinde Estate in London. The five Chinese panels are of the late seventeenth century. The five Chinese pictures are of the same period as the panels, and have their original metal mounted frames. The Adam mantelpieces in the Rose bedroom and in the east bedroom came from houses on the Hinde Estate. TENANTS’ HALL. – This was until 1888 merely a barn adjoining what was then the farmer’s cottage. My Parents, anxious to have some large room for entertaining the tenants, made considerable alterations, which enabled it also to be used as the general living room for the family. As soon as the main part of the work of the new house was completed Mr. Benson drew out plans for the improvement of this room. By a gallery at the south end supported by pillars he cut off the staircase leading to the kitchen and old bedrooms; the proportions were improved by removing two low beams, and a large window was put in above the door at the north end. The large clock in the Tenants’ Hall was taken from the Roman Catholic Church of St. James’, Spanish Place, Manchester Square, London, when that Church was rebuilt in 1890, and the railing above the gallery was the Altar Rail in the same Church, which stood partly on land belonging to the Hinde Estate. The formal garden designed by Mr. Benson was laid out by Messrs. Baker of Codsall, Wolverhampton. It was necessary for the building operations to cut away the bank to a considerable extent, and the soil removed was used to improve the garden levels as well as to widen the road in front of the house. The garden is paved with stones from the Estate quarry. The garden view of the south elevation taken in summer 1921. This photograph was taken for the auction particulars of October 1921. A hard Lawn Tennis Court was laid down by Messrs. Morris in 1915 in the wood above the house. The Clochfaen Estate has been in the possession of the Lloyds for some hundreds of years, and there are in the British Museum Welsh poems of the fourteenth and fifteenth centuries addressed to the Lloyds of Clochfaen. The last Lloyd to live at The Clochfaen was my great great great grandfather, Jenkyn Lloyd, born in 1724, died 1766. He was High Sheriff of Montgomeryshire in 1755. His father, Rhys Lloyd, and his grandfather, Jenkyn Lloyd, were also High Sheriffs of the County in 1743 and 1713 respectively. 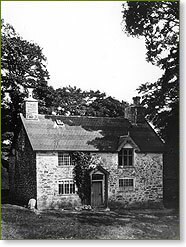 After the destruction by fire of the house in 1760 Jenkyn Lloyd moved to his wife’s property of Plas Madog, Ruabon. He was murdered in Shrewsbury in 1766 by his doctor and cousin, Sir William Fowler. 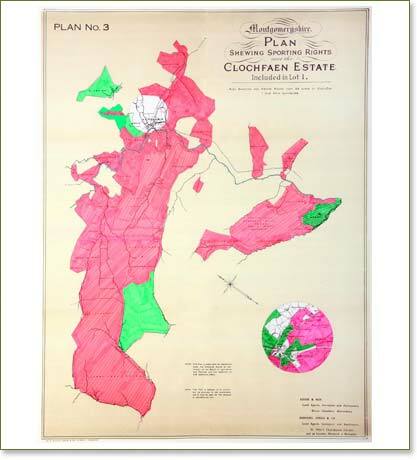 On Jenkyn Lloyd’s death the male line of the Lloyds of Clochfaen died out, and the Estates, considerably diminished in extent by the forced sale of Plas Madog and of property in Montgomeryshire, have descended to me through the female line. My Father and Mother took the deepest interest in the place and people, but the old family house was never rebuilt and we were anxious to do this with as little loss of time as possible in order that our children should grow up in the place where their forbears had lived for so many centuries. Despite the optimism of Harry Lloyd Verney, the new Clochfaen was not built at an auspicious time, and, before the Benson project was complete, the world was at war. “This house was built by Harry Lloyd Verney and Joan his wife, AD 1915”. As the years of war passed, with so much carnage and loss of young life, the effects of the conflict took their toll, including upon the Royal Family. 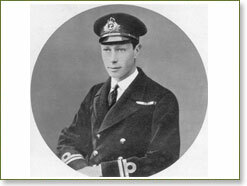 On 31st May, 1917, the young Prince Albert, Duke of York, served at the naval battle of Jutland, “the greatest sea battle of all times” – at least until World War II. Prince Albert had just rejoined his ship, HMS Collingwood, when the British and German fleets engaged at Jutland. HMS Collingwood was a battleship in Jellicoe’s squadrons that joined in after Sir David Beatty had begun the action. Collingwood escaped damage and Prince Albert was mentioned in dispatches for his coolness under fire. Yet illness had dogged Prince Albert throughout the War, and, after Jutland, he suffered severely from the effects of a duodenal ulcer. Accompanied by Louis Greig and Campbell Tait, he returned to Windsor on 13th August, 1917, and, after a month’s rest and quiet, went to recuperate for three weeks with Sir Harry and Lady Joan Verney at the new Clochfaen. But it was evident that, even when leading “the quietest of lives” and “eating the simplest of food” from the Clochfaen kitchen, his complaint would not yield to treatment, and, with the medical support of Louis Greig, he wrote imploring his parents to agree to an operation which would remove the cause of all his trouble. “I don’t think I can get any better without an operation and I should like to get it over and done with”, he wrote to the King in great depression from Clochfaen. During his stay at Clochfaen, the young Prince worshipped at the Parish Church and, on 22nd September, 1917, shot game on the Estate with Dr Greig and Harry Lloyd Verney – one partridge, one hare, one snipe and a hapless pigeon. The local population were amazed by the sight of a manned sentry box at the Benson house. 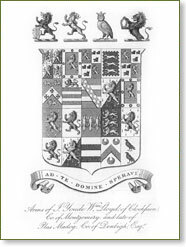 The royal arms were displayed at The Clochfaen for decades after. 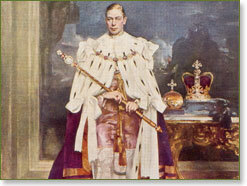 In 1937, on the abdication of his elder brother Edward, in circumstances which are well known, Prince Albert was crowned King George VI, and inspired Great Britain as its monarch through the Second World War. 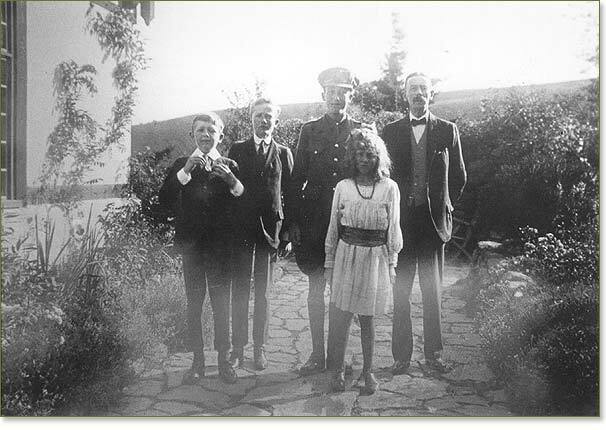 Lloyd Verney Family in the new garden at Clochfaen circa 1917. The 1914-1918 War shook the establishment and swept away the pre-War social order. Many agricultural Estates ceased to be economic and many country houses fell into ruins. 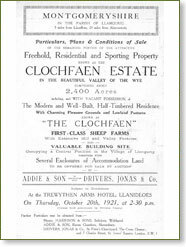 Change was such that, as E T Stirk reflected, the life style at Clochfaen could no longer be maintained, and, by 1921, the Clochfaen Estate was for sale. In the year 1927, my Father, Aubrey, had been looking for a place with some fishing and holiday accommodation for the family - nothing so extensive as the property he eventually acquired. But having seen an advertisement offering the property at Llangurig with four miles of fishing rights and some 4,000 acres of sporting rights with the house, etc., he decided to go and look at it. At that time we were driving a Buick (American touring car) - it was the most reliable car we had ever had, and would just take the whole family of six. The journey without mishap took about two and a half hours from Wolverhampton to Llangurig. 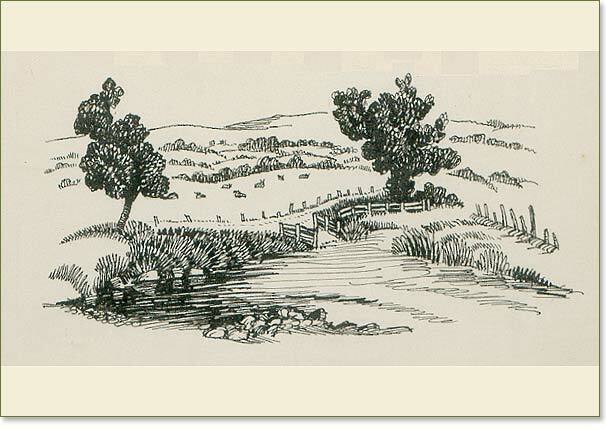 As we turned off the main road to cross the river, we approached the house along a country lane. We passed close to a farm house with outbuildings on the opposite side of the road, having stopped to obtain the keys from the farmer. We continued along the occupation road, then un-metalled. The road was, and still is, tree lined. A white gate marked the entrance to the Clochfaen grounds, from which the road rises some distance to the level of the house, a long building, much of it clinging to the hill side. It was a damp but bright Autumn day when we drew the car up outside the house. A variety of colours from bright yellow to dark red from the leaves on the trees and bushes covering the hill side and around the house gave the whole an effect of beauty. A coating of soft vegetation was spongy to the feet. But perhaps the more striking than vision or feeling was the smell of the pines, unadulterated except for the other sweet smell of damp vegetation. 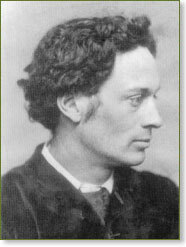 Frank Aubrey Stirk. 1930. First visit, October 26th 1927. We were impressed by the black and white half timbered structure, but the whole property, both inside and out, was suffering from some six years of neglect. The garden and grounds were completely overgrown, and the ground and pathways near the house were covered with a deep layer of grass and moss. When in the garden, it was impossible to see the cottage block, and we had no time to go and look for it. On entering the house it was in a state of complete damp desolation. Most of the ceilings had fallen and water had obviously poured across the floors downstairs, possibly caused by burst central heating pipes. In spite of all this we felt that the whole place was most attractive, and although no one had a clear idea of what we could do with it, we all without exception were eager to make it ours. I remember in the first letter from the Solicitors who were acting on the sale that, in one paragraph, they said "part of the property is ripe for falling down", a typist's error altered to "pulling down", which was not in itself very encouraging; and it may be that the part of the house so described is that altered by me fifty years later to what I hope will be a satisfactory home. Fools we were thought to be, and perhaps we were, but in the event, after quite a short time, we negotiated to purchase, and completed the acquisition in January, 1928. The south portion of the house had been added in 1915, commenced just before the 1914 War. The intention was obviously to produce a country house in keeping with the status of the Verney family, the then owners, Harry Lloyd Verney being Private Secretary to Queen Mary at that time. Interesting features were introduced such as a mantelpiece in the entrance hall from a house in London once occupied by Nell Gwynne, an Adam marble mantelpiece in the drawing room, and various bedroom fireplaces of that period. 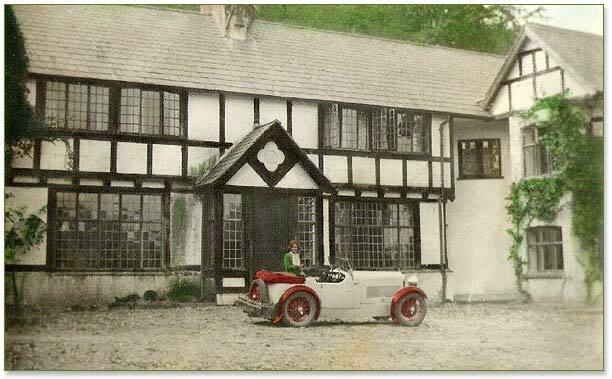 The cottage block with garages and stables had been built in 1912 by Morforwyn Lloyd Verney, the Mother of Harry. It was a structure of the most robust construction, reputed to have cost £1,300, the stone being hauled from Builth. As the 1914 War had progressed, bringing attrition in its wake and changing the lives of so many of us, the life style at Clochfaen became more and more difficult to maintain. Finally, at the end of the War, it had been decided by the Verney family to dispose of the whole estate. The farms were sold off to the various tenants at prices which, even in those days, were very low, but it was never possible to find a buyer for the main house and cottages. 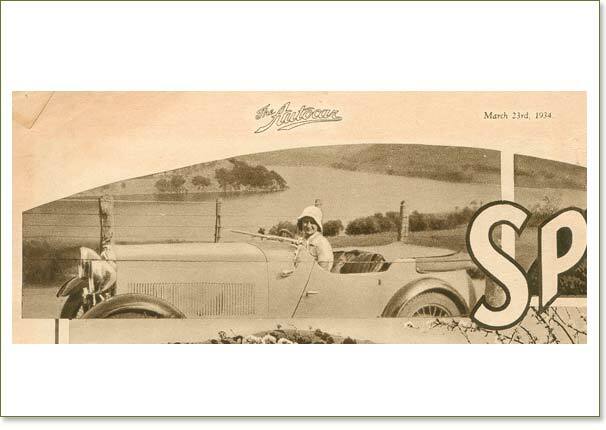 It must be remembered that motoring had not then become the pastime of many, and people who could contemplate buying such a property would feel that it was too remote. Whatever may have been the cause, the house had remained empty for six years and would have become irretrievably dilapidated had we not taken it over when we did. The first task was to make all the buildings watertight. A firm of local builders, Ellis & Meredith, achieved this in a comparatively short time, and we installed ourselves in one of the cottages at Easter, 1928. VI. THE CLOCHFAEN: 1928 - 2000. 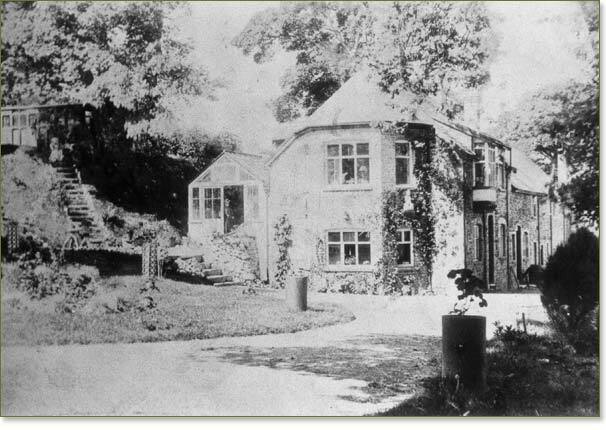 From 1928, the Stirk family occupied one of the Cottages for fondly remembered holidays, and Mr Aubrey Stirk fished the river Wye. 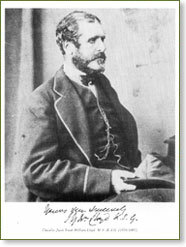 The other Cottage was occupied by Mr J J Campbell, a very effective gamekeeper and groundsman in the Lovell tradition. 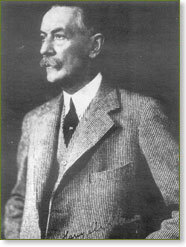 Aubrey Stirk died in 1932. After his death his wife, Norah, and their four children, Ruby, Jim, Audrey and "Jack" (as E T Stirk was known) turned their energies to the main house, which Aubrey had once said (in response to young Jack's wish that he could see it with all the electric lights on) would never be seen with any light in any window except a "penny dip", a kind of cheap candle of the day. The Cottages were both let to tenants, and the Stirk family, with Mr Campbell and his wife, came to live at the main house. The fishing on the Wye was much used in this period, as was the asphalt tennis court in the wood above the house - probably the highest hard lawn tennis court above sea level in England and Wales. As World War II approached, E T Stirk joined the forces and the family had less opportunity for holidays at Clochfaen. Country houses were now under threat of requisition for the accommodation of troops, and the family decided that Clochfaen had to be put to other uses. From 1939 until 1943, the main house was let furnished as the wartime base of the Emscote Lawn School, a private boarding school from Emscote, near Warwick, under its headmaster, Mr Farnfield. While in RAF training, E T Stirk flew his Tiger Moth as low as he dared over the roof of Clochfaen, bringing schoolboys streaming out in great excitement. Former pupils who have visited remember this event. For a brief period, a young Jewish refugee from Nazi Germany, Eva Kraus, lived at the Cottages, before moving on to a new life in New York. Her family were unable to follow. 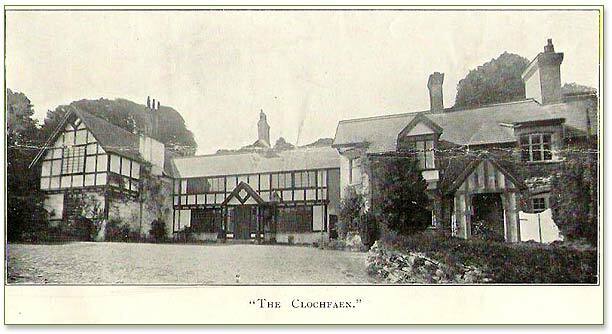 The hotel brochure went on: “Clochfaen Hall is a Country House dating back to early days. It stands over 1,000 feet above sea level, overlooking the River Wye and Llangurig village. 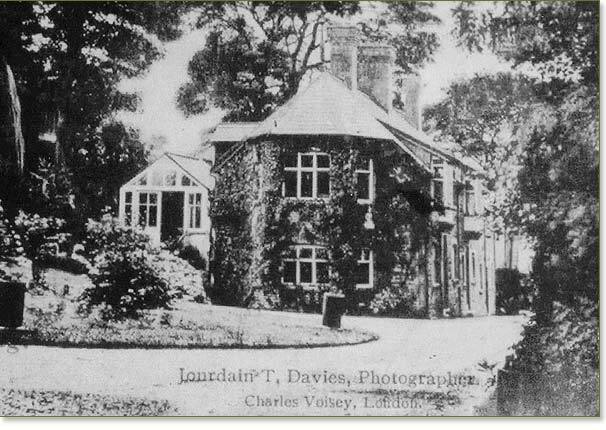 Great care and thought has been given to provide the utmost comfort for the guests, and the best of everything that can be obtained under war time conditions is at their disposal....Delightful walks and scenery can be enjoyed over some of the finest country in Wales, where a great variety of wild life can be studied. After the War ended, in 1945 Ruby and Audrey Stirk came to make their permanent home at Clochfaen where they were to spend the rest of their lives. In 1979, E T Stirk and his wife Peggy moved into the Victorian part of the main house, and lived there until 1998. R S Thomas, “Border Blues”, Poetry for Supper. In 2000, the Clochfaen main house with its woodlands and fishing and sporting rights over the old estate lands, was purchased from the Stirk family by Kevin Hughes and James Stirk. As "The Clochfaen Partnership", Kevin and James have contributed much time, resources and labour to the restoration of the property in every respect, from roof to floors - and below - interiors, soft furnishings and furniture. 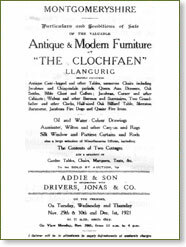 A number of items of furniture have been at Clochfaen for more than eighty years. We hope that many more guests and friends will come to enjoy Clochfaen and its facilities, with a thought too, "when the stars are quiet," for its long history. James R Stirk and Kevin Hughes. The portrait of Chevalier J.Y.W. Lloyd is from Cambrian Archaeological Papers X1 and is reproduced by permission of Llyfrgell Genedlaethol Cymru/The National Library of Wales. Certain other images were kindly provided by D. Lovell and Major P. V. Verney. Copyright in text and images reserved to J R Stirk and K Hughes and their licensors. The History of the Parish of Llangurig, E. Hamer and H. W. Lloyd, London, 1875. The History of Powys Fadog, Chevalier J. Y. W. Lloyd, Volume II, London, 1882. A Description of the Parish Church of Llangurig, G. H. Lloyd Verney, London, 1892. “The Clochfaen”, H. Ll. Ll. Verney, printed monograph, 1916, by permission of Major P. V. Verney. Lady Joan Lloyd Verney, unpublished memoir, by permission of Major P. V. Verney. The Coronation Book of King George VI and Queen Elizabeth, Odhams Press, London, 1936. King George VI, His Life and Reign, J. W. Wheeler-Bennett, London, 1958. E.T. Stirk, unpublished recollections, 1979. “The New Clochfaen, the Arts and Crafts Movement and W. A. S. Benson”, J. R. Stirk and R.W. D. Fenn, Montgomeryshire Collections, 1987. The Joyous Patriot, the Life and Letters of Sir Ralph Verney, D. Verney, London, 1989. 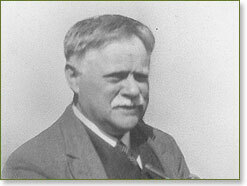 W. A. S. Benson, Arts and Crafts Luminary and Pioneer of Modern Design, Ed. I. Hamerton, Antique Collectors’ Club, 2005. Archives of the Stirk Family and the Clochfaen Estate, held privately.